Should you develop your own inside sales team or hire an outsourced lead generation firm? It might feel like a challenging dilemma, but it doesn’t have to be. Intelemanage combines the best aspects of in-house lead generation with the mission-critical capabilities not present in most companies contemplating the insource vs. outsource decision. Our sales management experts will be involved with the recruiting, interviewing, hiring, onboarding, coaching and managing of your inside sales agents. Intelemanage will also provide the cloud-based telephony that allows for call recording and daily reporting. The result is a qualified team of high-performing inside salespeople who understand your solution, your sales process, and have the capability to make it happen! We manage your inside sales team while you keep running your business. It’s a foolproof, cost-efficient way to increase sales and generate revenue. We build your inside sales team. From screening resumes to conducting initial interviews, we have a system that helps us identify the right candidates. We vet their skills by putting them through the same rigorous process we use for our own agents which includes skills assessments, writing tests and auditions. This process allows us to send you only the most qualified candidates so you can gauge their fit with the culture at your company. You collaborate on goals and processes. This is your in-house sales team. That’s why we collaborate with you around performance goals and sales processes. Just as we do for our outsourced clients, we will design and customize every campaign you want to run. You remain involved so that the training and sales management we provide always aligns with your objectives. We manage agents and track performance. As soon as new agents get started, we monitor and evaluate their performance every day. We also provide reporting and data monitoring, so you have maximum visibility. You focus on your business. No lost productivity. No time wasted on ineffective hiring and training. With Intelemanage, we manage the performance of your inside sales team ( our core competency ) so that you can focus on your core competencies. 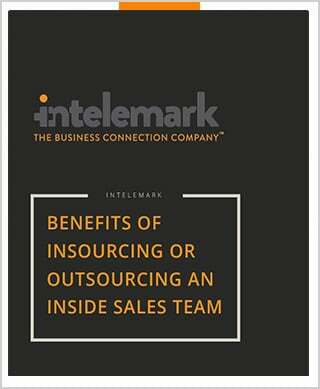 For those companies not comfortable outsourcing their inside sales function, Intelemanage provides a sales management solution that offers the best of both worlds. Intelemanage merges the advantages of in-house sales with the benefits of years of outsourced lead generation and business development expertise. As a result, you increase sales activity, expand your reach and grow your business (read revenue). Make sales insourcing work for your organization. Contact Intelemark today to learn more about our sales management solutions!